Its been busy busy here at Seaside. I am in the midst of designing some new invitations & stationery along with some new products coming out later this month. Since October is Breast Cancer Awareness month I have been inspired by all the PINK I see every where I turn. 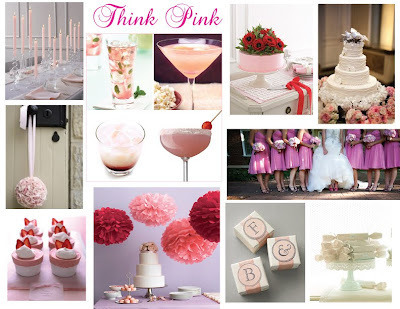 Below is a Think Pink inspiration board for all you pink brides out there. Check back at the end of the week to see the designs I came up with.